This is my second image from Carhenge, and by far my favorite. I’ve had more time to work with the digital development and how tonalities are expressed within the details of the sculpture, clouds, grasses and trees. I’ve created at least 10 different versions of the print, and as Ansel Adams would say, depending on how I feel at different times, I’ll probably print this in unique ways for years to come. An example: Adams printed “Moonrise, Hernandez” in a constantly evolving manner for more than 30 years. I think of this photo as one of the finest black-and-white images I’ve made. It has luminance, emotion, life and dimension, while simultaneously causing the viewer (at least this one) to come back to the image for more time and time again. Brett – another excellent image. 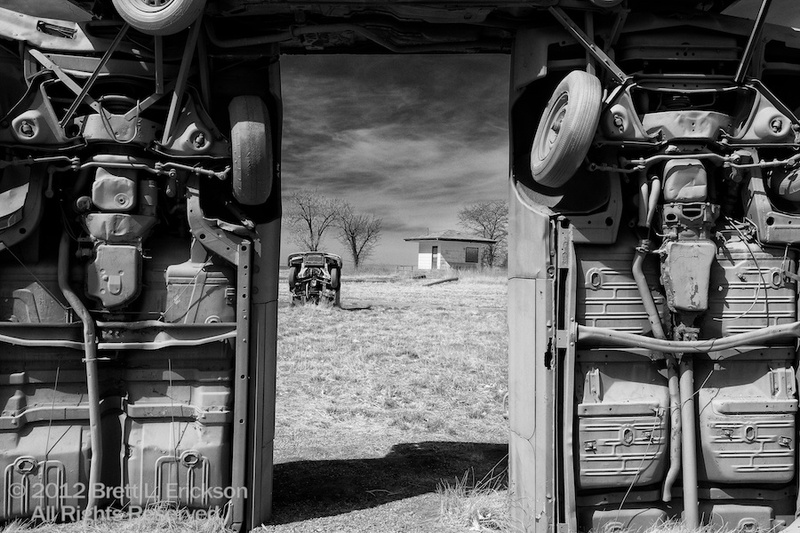 The first thing that struck me was the unusual way you framed the shot, which is a nice change from almost every other Carhenge photo I have ever seen. Then, I noticed the fine textures and the range of tones. You are right – it DOES draw the viewer into the scene, over and over! This is fantastic. Thanks for another great image. Love this museum. this is one of the best black-and-whites i have seen in my life. good job! And after looking at your work, I’m even more flattered! Your work is exceptional-nice tones, structures, stories and moments.